The rugged mountains and pristine coastline of Norway are spectacular throughout the year but during the winter months, it transforms into a truly special landscape. This is the realm of Golden and White-tailed Eagles, our main targets for this winter trip which has been designed to work in two ways. Firstly we will have exclusive use of a purpose-built hide where Golden Eagles have been attracted to food which is placed out every winter. This hide was established over ten years ago and attracts the resident pair from the surrounding mountains; juveniles from previous years can also drop in to visit. The second part of this trip will be to look for White-tailed Eagles along the fjords of Flatanger. To do this we will be going out in a small boat to look for the Eagles and then entice them down with a free fish. The pristine mountains covered in snow will be our backdrop. 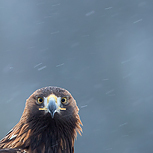 To photograph these two majestic raptors in one of the most beautiful locations in northern Europe and with the possible option of other local bird species to fit into an already very full programme it is hard to beat. Day 1: We travel to Trondheim (we will advise you on the flight recommendations) where we will be met by our Norwegian Guide Ole Martin Dahl. Ole then drives us (about 3 hours) to our base in Flatanger for the duration of the trip. Over dinner, we’ll discuss the priorities and options for the coming days. Days 2 – 7: The precise schedule will be very flexible based on a combination of the weather and individual priorities. We have potentially 2 hides for golden eagle and white-tailed eagle that will each accommodate up to 5 of us. 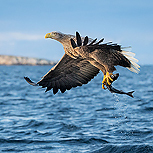 The boat trips to the fjords looking for the white-tailed eagles will be weather dependent but our aim for this trip is to maximise our potential for photographing this stunning bird with a wintery backdrop. We have successfully run a summer trip to Norway for a number of years and to do so in the winter is much harder, but the potential is huge. Winter is hard along this coast and that is what we want. It will be extremely cold on the boat but insulated sailing suits will be provided. Overall there is a fair amount of flexibility and personal choices to be able to be accommodated and we’ll review our options on a daily basis. We will also have the chance of using a special hide for photographing Goshawk and there’s also the chance of a dramatic Northern Lights display any evening if conditions fall in our favour. Day 8: We return to Trondheim and will head to the airport in the morning for our flights. Airport transfers, accommodation, local transportation, all meals, use of hides and boat excursions. Our purpose built accommodation, exclusive to our group, offers an excellent combination of comfort and practical electronics including wi-fi access. The walks to the hides can involve deep snow, but are rarely more than 10 minutes in length. Days in the appropriately equipped hides can involve up to 8 hour sessions, so a decent level of stamina and fitness is necessary and appropriate clothing and footwear too.